Someone Else Decided For Us…And We Deserve Better! The world is never going to pause and ask you if you’re ready. Events are going to keep happening. You have a choice to move out of the way, get run over, or take control and create the outcomes that you want. If that makes you nervous or anxious, well, you are not alone. At any given moment people all over the country, and in every profession, are struggling to maintain balance between two realities: the events going on in the outside world, and the storm of negative thoughts, doubts, and fears raging inside their heads, just out of sight from everyone else. This dual reality is incredibly stressful. It doesn’t have to be that way though. That’s the message author, speaker, and executive coach Cindy Rold shares in her signature talks. Ever since discovering her own inner strength by overcoming suicidal thoughts in college and recovering from a broken engagement to a man she later found out was a murderer and escaped convict, Cindy has been building her “resilience arsenal”. Today, she shares her story with women everywhere, helping them to not only see the strength that they do have, but also giving them the tools to become more resilient and to shape their destiny with. 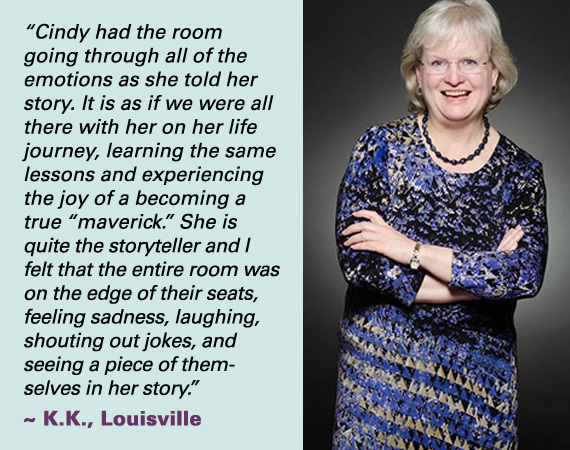 Whether she’s giving people the courage to take “smart risks,” showing them how to embrace change and use it to empower their lives, or by encouraging them to think clearly when the pressure mounts, Cindy brings an authenticity and passion to every presentation, and she will show you, and your audience, why she is… The Resilience Expert! Through sharing the story of how she was conned and betrayed by a murderer who had escaped from prison one week before he met her, Cindy shows others how they can also overcome setbacks, major or minor, by demonstrating courage and taking positive, life-affirming actions no matter what obstacles they encounter in their professional or personal lives. When faced with a challenge, do you give up or keep going? Do you procrastinate or act right away? Do you shrink back or step boldly forward? Find out ways to overcome challenges, large or small, so you can bounce up and continue at a higher level with your life, not just bounce back to where you were prior to tackling the challenge. We grow and expand only when we take risks, yet many are afraid of risks and shy away from them. Whether you’re speaking in front of a group, being promoted, or managing employees for the first time, you’re taking a risk. Learn practical and fun ways to make any risks easier to take so you can reap the rewards of engaging in risky behavior. Change is an undeniable fact of life – whether it’s societal change, professional change, or personal change. When faced with change, it is easy to resist or deny that it is happening or just be swept along by it. Those who thrive, however, know how to embrace change, not just accept and cope with it. In this program, learn about the change process and gain tools to implement changes successfully in your own life. To learn more, or to book Cindy for your next event contact us. © Copyright 2016 - Cindy Rold | Site Designed by Kevin Makes Sense Media.